As we have a few days off work we have had a few days when we have gotten up early and gone in search of good coffee and some nice breakfast as a bit of a holiday treat and as mentioned in an earlier post have become huge fans of Boho Express in Scarborough but yesterday thought we would head further afield a bit, well two streets closer to home and try another place that we had been past a few times in the previous weeks that had just opened. Preston’s take away cafe is located on Calais Road in Scarborough and in the past few years has been a range of different take away establishments and none of them have really worked well. For the past few months it has been undergoing a transformation into what it has now become – Preston’s and so we thought we would give it a try. If you have a couple of tables and some seats available then you arrive thinking that it is a dine in cafe but we were wrong it is purely take away and everything you order is served in take away containers which was a bit confusing and whilst we were sitting there saw a couple of people drive up and get out of their cars only to retreat when they realised it was not really a cafe but purely take away. But we persevered and ordered coffee, muesli and fruit salad and poached eggs with mushrooms and toast. Whilst the coffee was first rate the rest of the meal lost something in the translation being served in take away containers and the fruit salad and Bircher muesli were at least a couple of days old and not freshly cut and prepared and we’re also very small in their serving size. Poached eggs with toast and a side of mushrooms…just adequate! To be fair they say they are a take away cafe so we were not expecting table service and china plates but the sizes were really the issue and if I was walking past and wanted a coffee or lived close by I would purchase a freshly made coffee from them but the food left much to be desired. At least the coffee was good! By contrast we dropped into Boho Espresso again for a coffee and a muffin and the coffee was fantastic as always and the muffin was one of the best I have ever had…and I have had quite a few in my time…there are other places opening or have just opened in and around us in Scarborough and we will try some others but right now our breakfast cafe of choice will remain Boho Espresso. 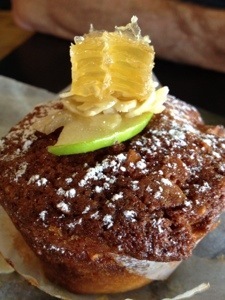 The stunning apple, almond and fresh honey muffin…delicious!